There's nothing like a delicious YA novel to get you through an otherwise stressful time. So, while I was neck-high in exam revision, I clung desperately onto the lifeboat of C.C. Hunter's "Born at Midnight", the first book of the "Shadow Falls" series. This book was on my recommended books list on my Kindle, so I decided to give it a go after seeing the good reviews. Plus, the title itself sounds pretty juicy, doesn't it? Sixteen-year-old Kylie Galen doesn't drink or do drugs. Heck, the farthest she's ever gone is kiss her now-ex-boyfriend Trey. When she's caught at the wrong party with the wrong people, Kylie finds herself whisked away to Shadow Falls Camp, a camp for troubled teens nestled deep in the woods of a town called Fallen. But within hours of arriving, Kylie becomes painfully aware that her campmates aren't just troubled. Instead, she's surrounded by vampires, werewolves, witches, fairies and shapeshifters who are trying to learn to control their magic and live in the human world. Kylie's never felt entirely normal, but she sure isn't a paranormal freak either. Or is she? As if that wasn't enough, Kylie finds herself drawn to both Derek and Lucas, a half-fae and a werewolf who couldn't be more different, but have a powerful hold on her heart. But with all her uncertainties, Kylie soon becomes certain of one thing: Shadow Falls is exactly where she belongs. If you just read the synopsis, it becomes pretty darn obvious that there's one serious love triangle going on between Kylie, Derek and Lucas. Unfortunately, I felt like this time, it was one of those love triangles where you end up finding the girl stuck in the middle incredibly annoying. Sure, Derek and Lucas are both good lookin' and warm and mysterious in their own ways, but that doesn't mean she has to make out with both of them! Oh, and it gets worse. Instead of just having two boys like any normal YA heroine, Kyle has three! So she ends up kissing Derek, Lucas and Trey. Kylie sure gets around. And while she does (sort of) try to stop herself so that she can sort out her feelings, she just doesn't exactly seem to care whoever she ends up making out with. Now don't get me wrong, Kylie's a sweet girl who's a pretty realistic teenaged character, but sometimes you gotta draw the line with these boys! What I think especially emphasized the whole annoying-player vibe with Kylie was that there hadn't really been enough build-up between any of the potential couplings to make the development of their relationships really believable. Instead, it was the boys just flocking towards Kylie for some reason, and that was that! Wow, that was a long rant. But it's not as bad as I may have made it out to be, trust me! She just kisses too many guys in a 400-page span. Other than that, "Born at Midnight" is a great book to read. I like the idea of a camp for paranormal teens. It kind of reminds me of Percy Jackson and Camp Halfblood, except with vampires and other things that go bump in the night. The characters are really fun to read about, especially the friendship between Kylie, Miranda and Della. The three seem to get into such amusing situations, like the perverted piano teacher who turns into a toad whenever he thinks inappropriate thoughts! The way their friendship developed was sweet and believable, and you can tell that they'll always have each others' backs, no matter how many times they bicker or tease each other. The plot of "Born at Midnight" can best be described as introductory. There's a lot of Kylie getting used to the idea of paranormals and trying to figure out who and what she is, and establishment of different characters and their personalities. In terms of tension in the storyline, I feel like there wasn't much of a climax or real action-y plot to follow. Instead, we read about Kylie and her friends at Shadow Falls Camp. The ending, however, definitely suggests that there'll be more antics and possibly a bigger picture to things, and hopefully the next books in the series will have some thrilling adventures of sorts. 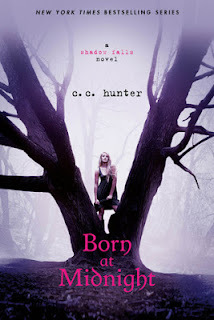 Overall, "Born at Midnight" is a fun start to the "Shadow Falls" series, with a nice cast of characters (despite the easy-lipped heroine) and build-up for some potential excitement and tension. I'd recommend this book to anyone looking for an easy YA read, or anyone who is head-over-heels in love with paranormal creatures.